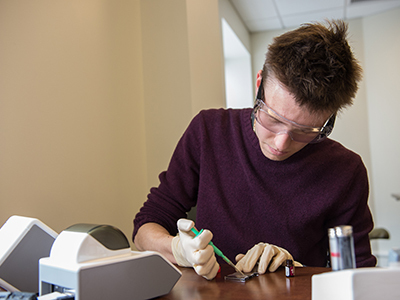 To highlight its students’ research work, Falk College will host the 2018 Falk Student Research Celebration March 27-30. The event will highlight Falk students’ research collaborations and their dedication to advancing research knowledge. Posters will be on display beginning March 27 near the second floor student lounge and the Café on 2 in the Falk Complex. Poster entry forms, which are available by contacting Amy Dumas at adumas@syr.edu, are due March 9. Submissions are due March 23. A student does research in the Nutrition Assessment, Consultation and Education Center. The college hosted the inaugural Falk Student Research Celebration in April 2017. The students were able to add presentation experience to their resumes, and also benefit from peer-to-peer feedback across disciplines. The celebration hosted a panel of student researchers who shared insights on how to get involved with research, present at conferences and other research-related topics. This event inspires students to get involved in a wide variety of academic research projects available to them throughout Falk and across campus. For active student researchers, it helps them discover new interests and opportunities, as well as new applications for their work. Hwang strongly recommends students get involved in the 2018 Falk Student Research Celebration. “I believe it will be a big motivation to start research projects with your advisor and colleagues,” he says.